At Mint Dental Care we place a heavy emphasis on prevention. Routine checkups and cleanings can help to prevent the need for further treatment. 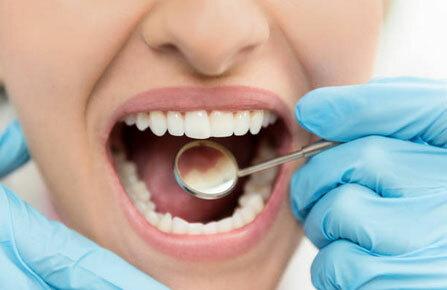 By providing these services, cavities can be detected at a very early stage and can prevent the need for more invasive treatment in your future. Early cavities are detected by utilizing our state-of-the-art digital x-ray system, which provides immense benefit with minimal exposure to radiation. Dr. Hamidi places great importance on the education provided to you regarding your treatment needs. Intraoral pictures displayed on large monitors allow you to see what we see and help you to understand the necessity of your treatment. The benefits of fluoride treatment have been proven time and time again through numerous studies. Fluoride serves to strengthen enamel, helps to prevent cavities, and helps to halt the progression of smaller cavities. Fluoride also helps to prevent and treat tooth sensitivity. Because of this, fluoride treatments are recommended for both children and adults. At Mint Dental Care, we incorporate the effective method of providing fluoride treatment via fluoride varnish. Oral cancer has one of the lowest 5-year survival rates of any type of other cancers. For this reason, Dr. Hamidi feels passionate about providing oral cancer screenings at every appointment for every patient at no charge. Have you ever wondered why you see dark lines and grooves in your back teeth? This is because the anatomy of our molars are more prone to staining and cavity formation. The pits and fissures in your back teeth provide areas for bacteria to harvest and are one of the most common areas where we see cavity formation. Dental sealants help to prevent cavity formation by covering these hard-to-reach areas. Sealants also make your teeth easier to clean with your toothbrush. These benefits can be realized by children and adults to help keep treatment conservative and enhance cavity prevention. Have you ever woken up with a sore jaw or have been unable to open early in the morning? Have you ever found yourself grinding your teeth or clenching your jaw when you’re stressed? The consequences of these behaviors can be debilitating. Tooth sensitivity, muscle pain, and cracked teeth are all consequences of grinding and clenching. To prevent grinding, Dr. Hamidi can create an occlusal guard, commonly known as a nightguard. These are custom made, comfortable trays that fit over your teeth. Dr. Hamidi utilizes in-house 3-D printing technology to ensure that a custom-fit guard can be made in a few short days. Call Mint Dental Care at (443) 917-6468 to schedule your routine dental checkup! “Staff was very friendly, professional, and office was very clean and inviting. I was very well taken care of. Best dentist I've ever been to and will continue to keep coming here as long as there around!” - Gregg M.